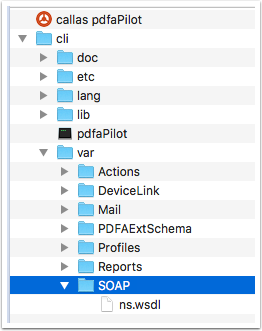 It is possible to submit jobs to a pdfaPilot instance and retrieve the results via SOAP requests. It is currently not possible to submit PDF files or kfpx Profiles via such SOAP requests, so both have to be available to pdfaPilot on mounted volumes. The SOAP requests wrap any command line parameters in <ns:args> tags. The simple requests below asks pdfaPilot to send usage information back by submitting the --help parameter. You may include as many parameters as required, there is no limitation. Any results will be sent back in XML back to the program that you have used to send the request. The example below is a simple SOAP request that asks pdfaPilot to create single pages from the original PDF file. Path and name of the PDF need of course to be adapted.